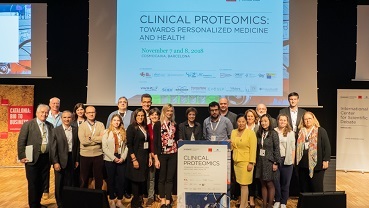 World leaders in proteomics will meet with local doctors and researchers on 7 and 8 November at CosmoCaixa Barcelona as part of the “Clinical Proteomics: towards personalized medicine and health” event. The aim is to push for the use of proteomics in personalized medicine. This includes the biochemical study of all the proteins that carry out biological functions in the cell, like regulating hormones, the immune system and blood clotting, among others. The event is hosted by B·Debate and organized by Biocat and the “la Caixa” Foundation. Functional information on protein activity can be an extremely valuable tool for catching diseases early, selecting the most appropriate treatment and monitoring therapy to get real-time results. The areas that can benefit the most from proteomics are oncological, neurovascular, cardiovascular and infectious diseases. Researchers from around the world are working on the Human Protein Atlas to map all of the proteins in human cells, tissues and organs, coded by the more than 20,000 genes identified by the Human Genome Project in the early 2000s. Each country is analyzing the proteins of one of the 23 human chromosomes. In Spain, a consortium of 20 laboratories is studying chromosome 16, because many of its genes are involved in oncological, neurovascular, cardiovascular and infectious diseases. The “Clinical Proteomics: towards personalized medicine and health” session, hosted by B·Debate, is organized jointly with the Carlos III Health Institute (ISCIII) ProteoRed and the proteomics departments at four Catalan research institutes: Bellvitge Biomedical Research Institute (IDIBELL), Vall d'Hebron Institute of Oncology (VHIO), Barcelona Science Park (PCB) and the Center for Genomic Regulation (CRG). The international scientists participating include Henry Rodríguez, director of the Office of Cancer Clinical Proteomics Research at the National Institutes of Health (NIH) National Cancer Institute (United States); Cecilia Lindskog, researcher at Uppsala University (Sweden) who has been involved in the Human Protein Atlas since 2006 and heads up the Tissue Atlas; and Ileana M. Cristea, professor at Princeton University (United States) who is researching the cell mechanisms that defend the body against viruses, among others.